Feeling stressed? Here’s how to release the stress. It’s a 4-minute nervous system reset. It restores the acid/alkaline balance in the blood. Stand up. Shake your arms. Relax. Feel your feet. I just did it. I feel great. Amazingly, I did more pushups than I’ve done in years. And they were done without any air in my lungs! Apparently the 30 deep breaths super-oxygenated my cells and it was that which powered me through the pushups. Awesome. That is called a tree. When you say “that is” you confuse the word with the reality, which is infinitely deeper. Don’t let the child slip away at an early age into the conceptual realm, believing exclusively in words. There comes a time when a child demands to be fed words and concepts: What’s that? At that stage they want concepts, words. What’s that? asks the child. That’s a tree responds the adult. If you say “that is” the child will confuse the word with the reality, which is infinitely deeper. By saying “that is” the child loses touch with the actual, direct experience of reality. And as the child accumulates words, the child begins to believe that when he/she says “this is a tree” that’s all there is to know about the tree. Later, the child might take a biology class and get a few more names to attach to the tree, or the names of different trees. Immediately, the depth of the tree recedes and is replaced by a relatively dead thought form, “tree.” That’s how language deadens aliveness. When you teach a child language, the child should stay in touch with the actual thing. So you should say “It is called” not “It is” and encourage the child to continue to look, to touch, to listen. Look there, touch, listen. Then everything isn’t obscured with words. Stay with the reality. Some of the direct experience remains with the child. For most of us adults, we have been deadened by words. It is only later in life, after much shaking up that we break out of this and we start living again. Whenever you teach the child, help him/her to realize there is more beyond the words. There is reality beyond the words. You are not John. John is the name we have given you. You are not your name. It’s just a name. Before free-divers do a dive they spend time doing deep breathing and quick breathing. The purpose of this breathing is to maximize the amount of oxygen in the cells. The extra oxygen in their system enables them to dive deeper and longer. In Scott Carney’s new book, he says that ordinarily he can do 20 pushups. While researching his book he attended a workshop where he and the other workshop participants did deep and quick breathing for an hour. At the end of the hour the participants were instructed to do pushups. Carney did 40 pushups – while holding his breath! Today I figured that I would give this a try. I went for a one hour walk. During the walk I did a lot of deep breathing. After the walk I worked out. My personal best went from 2 reps to 5 reps! Interesting note in Carney’s book: Controlled hyperventilation will increase oxygen saturation in the blood to 100%, but more significantly, it also expels CO2 which your body uses to gauge when to gasp. For at least half a century the conventional wisdom about maintaining good physical health has rested on the twin pillars of diet and exercise. While those are no doubt vital, there’s an equally important, but completely ignored, third pillar – environmental training. Once you arrive at high altitude, your body automatically produces more red blood cells to compensate for lower oxygen saturation. Move to an oppressively hot environment and your body will sweat out fewer salts over time and produce lower volumes of urine. Heat will also stimulate your cardiovascular system to become more efficient and increase evaporation and cooling. Yet no environmental extreme induces as many changes in human physiology as the cold does. A plunge into ice-cold water not only triggers a number of processes to warm the body, but also tweaks insulin production, tightens the circulatory system, and heightens mental awareness. A person actually has to get uncomfortable and experience that frigid cold if they want to initiate those systems. Despite all of our technology, our bodies are just not ready for a world so completely tamed by our desire for comfort. Without stimulation, the responses that were designed to fight environmental challenges don’t always lie dormant. Sometimes they turn inward and wreak havoc on our insides. An entire field of medical research on autoimmune diseases suggests they originate from fundamental disconnect between the outside world and an under stimulated biology. Thoughts are just things. They should be looked at and examined. You are not your thoughts. Thoughts are merely things generated by the mind. When I was a child I was told to walk up stairs on the balls of my feet. As a consequence of that guidance my calf muscles have, over the years, shortened. Shortened calf muscles have caused all sorts of problems: difficult to stand erectly, difficult to squat properly, limited flexibility, and others. So, what is the right way to walk up a flight of stairs? Answer: walk flat-footed. On each step your foot should be flat on the step. 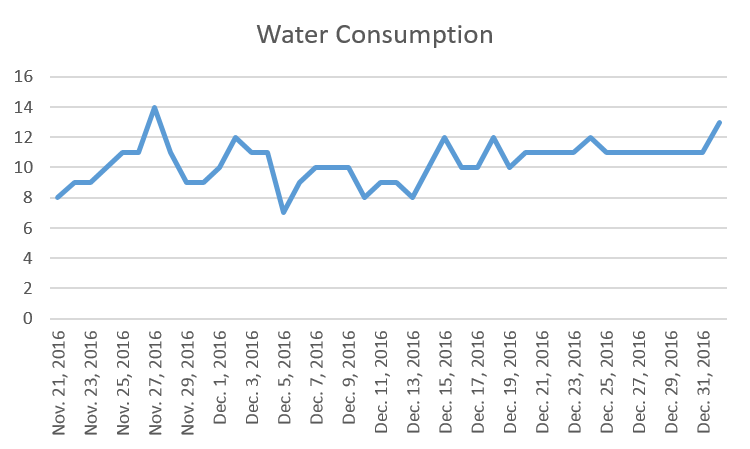 Last November I decided to drink more water. Experts say that you should drink between half an ounce and an ounce of water for each pound you weigh, every day. So for me, I should drink between 8 – 16 cups of water each day. 16 cups = 1 gallon. So I decided to shoot for drinking 16 cups (1 gallon) of water each day. The chart below shows my progress. The worst day was 7 cups, the best day was 14 cups. I learned early on that it’s much easier to consume warm water than cold water, so I warm up each cup that I drink. Lately I have been putting 1 tsp. of baking soda into a cup of water (once or twice daily). I read that that is supposed to be beneficial, although I don’t know how. I still haven’t reached my goal of 16 cups, but I am happy with the progress that I’ve made. You are currently browsing the Diverse Thoughts blog archives for January, 2017.